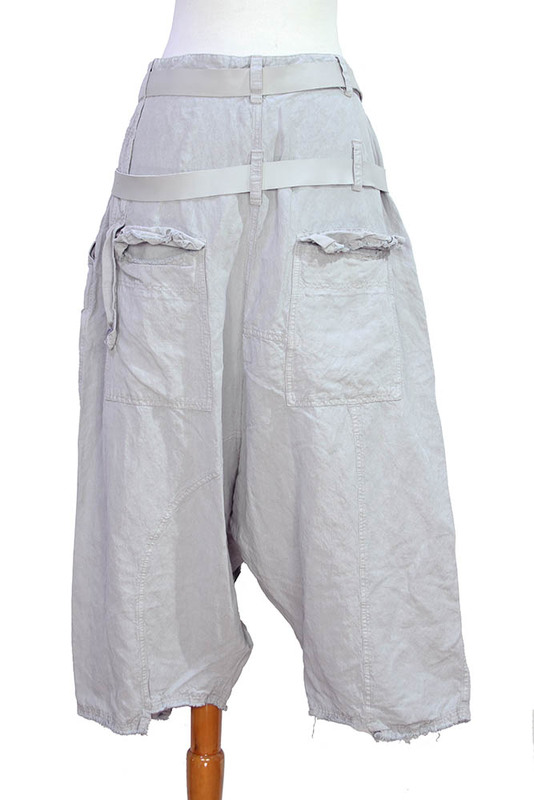 Pal Offner Unisex 'Super Low Trouser' in smoke colour (light grey) linen/silk fabric, cut-off trousers. 2 rows of belt loops and leather belts with metal buckles. Extra long button fly with placket. 2 side pockets and 2 rear patch pockets, with flaps and the rear left has a fabric tab with button fastening extending down from the waist band. wide legs with 2 level hems and raw edged finished trim. Totally awesome trousers, highly recommended. size 2 - small.